Exquisite detail and quality.Sophisticated shape combined with soft curves and the attractive color with high quality two-tone metallic and pearlescent paintwork which complements any interior and appeals atmosphere of trust to the customer. 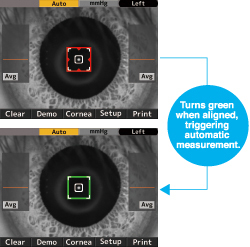 The S.P.C system, which includes our newly developed algorithm measurement engine, makes it possible to adjust air pressure instantly and precisely to match the patient's intraocular pressure. It also keeps noise to a minimum and ensures soft air pressure. Smooth and accurate alignment function. Once aligned, air pulse and measurement commence automatically. By keeping measurement time to a minimum, patient stress is reduced. 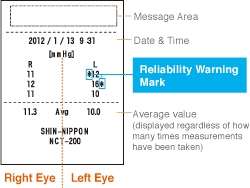 The warning mechanism displays an asterisk on the screen when measurement reliability is low. "Is the measurement point properly aligned?" "Is the patient’s eye opened wide?" 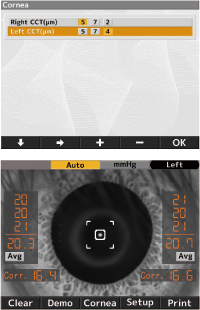 The IOP value is corrected automatically by simply inputting the central corneal thickness. This can be done easily before or after measurement. 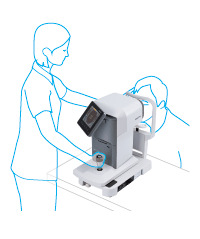 When the nozzle is too close to the patient's eye, an alarm is triggered and the words “Too Close” appear on the monitor. 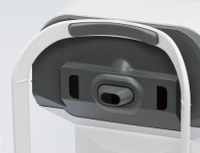 In addition, the safety stopper function prevents contact with the patient's eye. 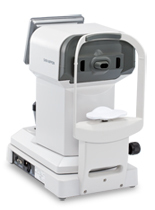 The feather touch sensor button, designed for compatibility and interface with the screen, make our non-contact tonometer easy and reliable to operate.